Data Translation announces a multi-sensor measurement module with USB port and plug-and-play connectivity. 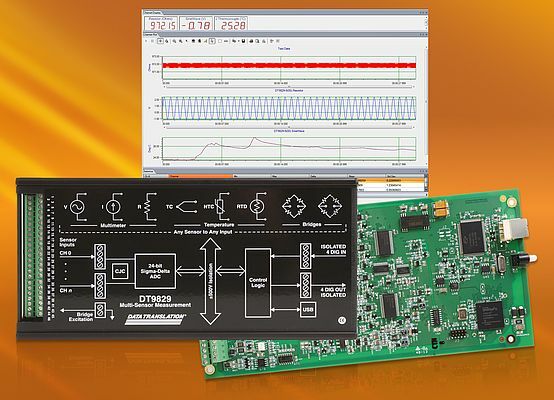 The module supports the direct connection of an array of different sensor types, from NTCs, thermocouples and RTDs to strain gauge sensors and load cells. The new DT9829 is available with two, four or eight inputs, featuring separately programmable gain and sensor settings for each differential input channel. Voltage, current and resistance measurements are also supported. With the included QuickDAQ software, all the settings are easy to configure for each channel and each connected sensor type; no additional external components or hardware configurations are necessary. The high accuracy measurement module has a 24-bit A/D converter and achieves a sampling rate of up to 960 Hz. In addition to the analog channels, the module provides four digital inputs supporting the connection of TTL, 12 V or 24 V levels. Four open collector outputs allow the switching of relays and other control tasks. All inputs and outputs have 500V isolation from the USB ground. The multi-sensor module is available as a rugged connection box with screw terminals or as an OEM embedded board-level version. Running entirely on USB power, the measurement module is good for use as a portable device.